You will find us in the heart of the Loir Valley, less than 10 minutes from "La Flèche" and "Le Lude". On sunny days, you may relax by the swimming pool or in our extensive gardens beside the river. In the winter, you will be warmed in front of the wood stoves. Peace, comfort, authenticity, will be the ingredients of your stay here. We have many hiking trails which will allow you to understand our countryside composed of wooded valleys, meadows bordered by rivers and farmlands. The Moulin de la Diversière has been awarded the Green Key Label,which is part of a process respectful of the environment and sustainable development. In 2011, we opened our third gite made of fully pressed straw; this eco-building which will give you an unusual holiday and time to enjoy a change of scenery. 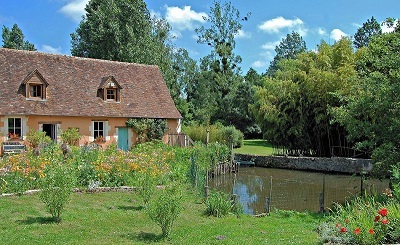 The Moulin de la diversière is a partner of the Zoo of La Flèche. Moulin de la Diversière has partnered with La Flèche zoo to offer their guests a 3 € discount per adult and a 2,50 € per child on zoo entry when booking at the Moulin. "In a loop of a small river, a honey-coloured mill surrounded by trees, silence and willow-fringed paths leading to two cottages -yours for self-catering or B&B-that Anne and Jean-Marc have lovingly converted in tune with the setting and their green ideals. Outside: a big sloping garden, a play area for your children(and theirs), shady arbours, an above-ground pool. Inside: old tomettes and limewashed walls, cane chairs and fresh flowers, pretty kitchens and showers with pebble floors... Special indeed."